Every time I go to Ireland, all I want to eat is bread and butter. The great tradition of whole grain soft soda bread with sweet, rich butter makes a perfect meal. The world of soda-risen breads is a realm unto itself that thrives only where the conditions are right. The essential ingredient is whole grain soft wheat flour. It’s not cold enough in Ireland to grow the hard wheat famous in northern Europe, the US and Canada. We produce the high protein flour needed for crusty baguettes, fluffy buns and crisp pizzas. Softer wheat flours are perfect for cakes, muffins and biscuits. The Irish take this soft wheat and coarsely mill the whole grain into a flake-filled brown flour unlike anything we can find here. Only this flour makes a proper brown soda loaf. As St. Paddy’s Day approaches, our supermarkets and bakeries will offer raisin-studded sweet round cakes called “soda bread,” but believe me, these are shameful representations of what’s commonly found on Irish tables. Ireland is still dairy country. In the 19th century the Cork Butter Market was the world’s largest and shipped Irish butter as far as New Zealand. Even today Kerrygold is marketed internationally as a premium European style butter. European butter has a higher fat content than US butter, making it prized for both spreading and cooking. Whenever I come home, I wish I’d had room to pack a couple of bags of Odlums wholemeal flour, but I know I can find the good Irish butter in most supermarkets. I often try to replicate a soda bread with the supermarket King Arthur flours in my pantry. It’s never quite perfect, but often it’s very good indeed. Here’s a perfect loaf for the yeast-timid baker. Soda bread begins with a soft dough stirred together by hand or with a rubber spatula, scooped immediately into a prepared bread tin, baked in a hot oven and ready from start to finish within an hour. Only a small amount of sweetening, if any, should be considered. A good measure of seeds or chopped nuts adds crunch and nutrition to an already wholesome loaf. 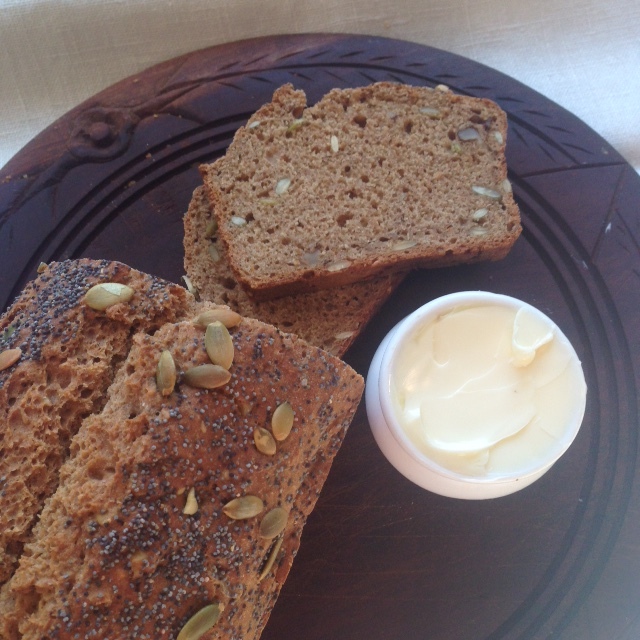 This seedy soda bread makes excellent toast or a base for open sandwiches and keeps well for several days. *To make thin yogurt, mix 7 fl. oz. each whole milk plain yogurt and milk. Cover and leave overnight at room temperature to lightly culture the milk. Preheat oven to 400°. Butter a 8½ by 4½ by 3 inch loaf tin. In a deep measuring cup stir together 12 fl. oz. (1½ cups) buttermilk or thin yogurt, molasses and oil. Hold remaining buttermilk nearby. Sift the flours, salt and soda into a medium bowl. Stir in the wheat germ and seeds. Make a well in the center of the flour; add the buttermilk mixture all at one go. Stir together quickly with a rubber spatula, adding the additional buttermilk if needed to make a soft, wet, muffin-like batter. Scoop the dough into the prepared pan. Dip your hand in water and use it to evenly pat the surface. Cut through the center of the dough lengthwise with a damp knife; sprinkle the top with a few more seeds. Bake in the center of the preheated oven for 35 minutes. Turn off the heat and leave the loaf in for an additional 10 minutes to deepen the brown crust. Cool before slicing. You are currently browsing the Mary Jo's Kitchen blog archives for February, 2016.